What is your Fashion Week beauty routine? Every morning I de-puff my face using a jade roller by Nurse Jamie which really works and makes my cheekbones pop. During Fashion Week I step it up by double cleansing in the morning and applying an Erborian sheet mask before bed. What are your favourite products for travel and a hectic lifestyle? I like to refresh my skin with a spritz of Mario Badescu rose water during flights or between shows, and I wear Bobbi Brown face base SPF50 and Erborian CC cream as they are moisturising and light but still provide good coverage. I pre-prepare lunches for work. I also often swap out red meat for leaner meats like turkey which contains less fat and is better for cholesterol. And I make sure to always stay hydrated. 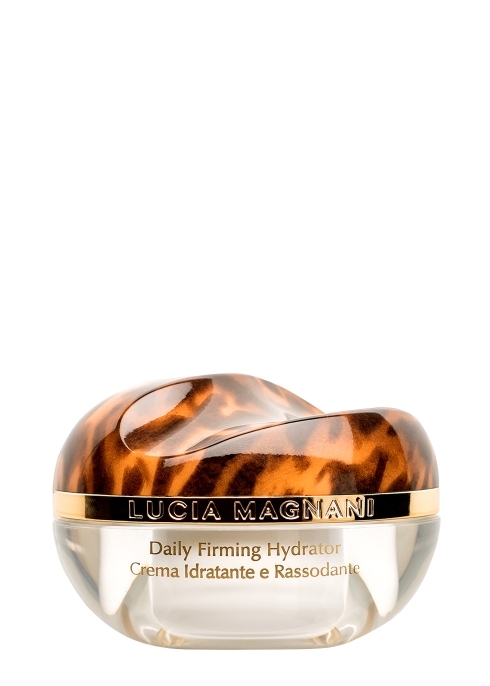 Massage Lucia Magnani Daily Firming Hydrator into your skin to make it glow. Apply Charlotte Tilbury Portobello Girl Lip Gloss for a perfect pink pout. For skin that looks healthy and fresh, apply skin-loving Exuviance Coverblend foundation. Create the easiest 60s style eyes with Sensai Liquid Liner in black along your lashes, tapering into a flick. Plump and hydrate lips ahead of lip gloss application with VENeffect Anti-Aging Lip Treatment.